The Pedro Estate in Nuwara Eliya. 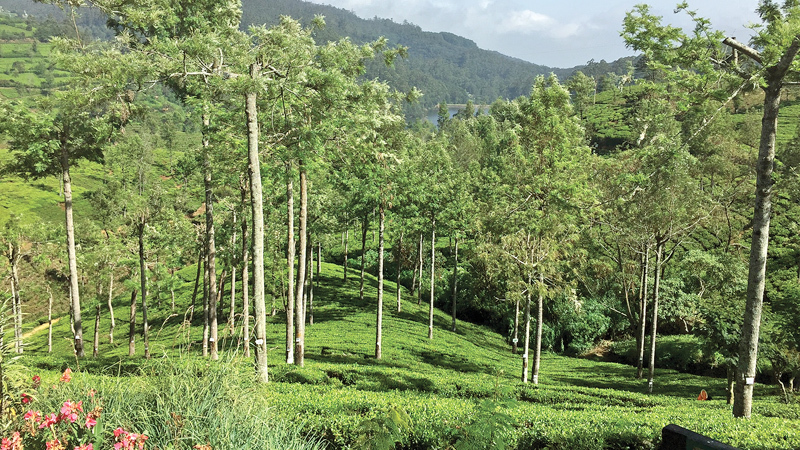 On a recent evening, Elizabeth Mary stood outside her line home on the Pedro Estate in Nuwara Eliya, occasionally batting flies from her hands and face. But she doesn’t have the time to press the management who controls the land to fix it. Although she has no children, she takes care of her 73-year-old mother, and cannot work. Ever since being brought to Sri Lanka by the British in the 1800s to work in the plantations, the lives of the people in the up-country have largely been defined by struggle. Up-Country Tamils, or Indian-origin Tamils, had their citizenship rights stripped from them in 1948. Successive governments have slowly granted citizenship to portions of the population through piece-meal political deals over the years, culminating in the Grant of Citizenship to Persons of Indian Origin Act of 2003, just 15 years ago. MP M. Thilakarajah, Nuwara Eliya District. Now, workers and community leaders say they are desperately trying to catch up to the rest of the country. Those costs are physical: the tea estates have the highest rates of maternal mortality in the country and about 30 percent of children below 5 are underweight, according to the World Bank. Now as the battle in the country’s central highlands has turned to the immediate issues of the day – wages, housing, health, plumbing and clean water – the legacy of those citizenship battles persist. MP Thilakarajah said it’s hard to understand today’s issues without remembering the fight for the most basic right: being recognized as a citizen in the eyes of your state. He said the lives of the people in the up-country mirrors the lives of the plant they spend their lives tending. The British colonizers began bringing labourers to Sri Lanka from South India in the 1820’s to work on the island’s coffee plantations. They were kept as captive labour, made to do the back-breaking work of clearing the jungles and starting Sri Lanka’s plantation economy from the ground. This brutal history is reflected in the landscape: most of the island’s cloud forests and upland jungles have been transformed by hand into neat, terraced estates. There’s a place near Haputale known in Tamil as “Crying Hills,” in memory of all the people who died there clearing the forests. For about a century, the Tamil estate workers did not have“any organization,” according to MP Thilakarajah. “There was not any political or trade union or anything,” he said in a recent interview. But in the 1920’s, inspired by Russian Revolution and political organising in India, Up-Country Tamils formed their first trade union, and began agitating for citizenship rights in the colonial state. Just before independence the number of Indian-origin Tamils working in and around the estates was about 11 percent of the total population. Soon after independence, though, Parliament passed two acts which would affect the lives of these communities for years to come: the Citizenship Act of 1948 and the Indian and Pakistani Residents Act of 1949. “Although these acts were ostensibly about clarifying who was a citizen of this new nation-state, they implicitly ensured that certain people, specifically Indian Tamils, would not become citizens,” writes Daniel Bass, an anthropologist who has extensively studied the Up-Country Tamil Community. The sad irony of this maneuver – or as many historians argue, part of the reason for it in the first place – is that the year before, Up-Country Tamils had elected seven Indian-origin Tamil MPs to Parliament. They had also helped to elect nine Marxist Sinhala MPs, which rattled the elitist political establishment. “It was a very pathetic period, 1948” he said. Nearly 20 years passed, and in 1964, Prime Minister Sirimavo Bandaranaike and Indian Prime Minister Lal Bahadur Shashtri tried to bring a political solution to the fact that nearly one million people of Indian origin were living in Sri Lanka’s highlands, unrecognized by any government. The Agreement on Persons of Indian Origin in Ceylon, signed in October, said that 300,000 Up-Country Tamils would be granted citizenship, while more than 500,000 would be “repatriated” back to India. MP Thilakarajah, then growing up on the Medacombara Estate near Watagoda, remembers friends and neighbors leaving for India. After receiving an Indian passport from the high commission in Kandy, “from my village, they got a ticket to Tiruchirappalli from the railway station,” he said. “It meant from here, all the way to there, they traveled with one ticket.” But the agreement was implemented unevenly. Many Up-Country Tamils did not want to leave their livelihoods for homes they did not remember or never knew, and India was slow to repatriate the nearly half a million people. When the ferry service between Sri Lanka and India was shut down during the civil war, the agreement effectively ceased. By 2003, between 200,000 - 300,000 people of Indian origin were still stateless, according to a UN estimate. In that year Parliament passed the Grant of Citizenship to Persons of Indian Origin Act,which said that all stateless persons of Indian origin who had lived in Sri Lanka since October 1964, and their descendants, were eligible for citizenship. But MP Thilakarajah said that even after 2003, and even after an additional act passed in 2009 to address war refugees, the citizenship battle is not over. “Those decades of neglect and indifference are hard to combat and take a long time to undo,” he said in an interview. 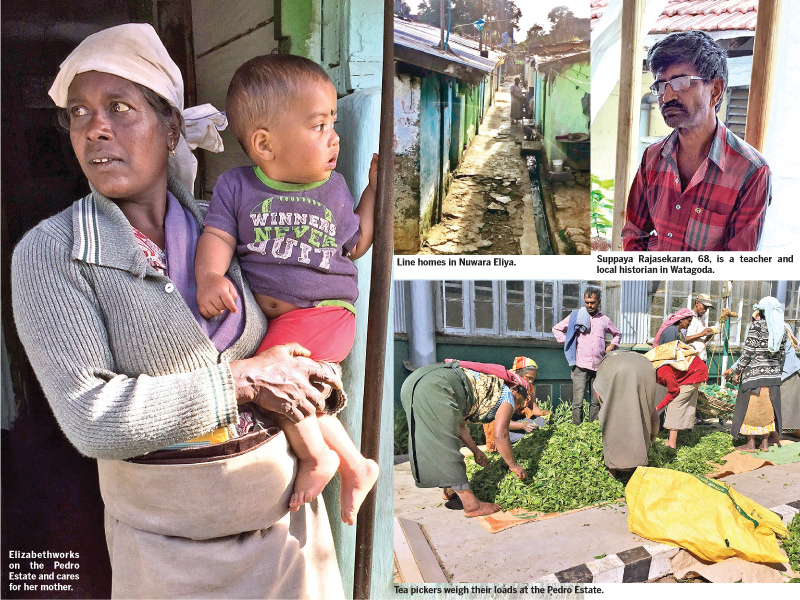 Suppaya Rajasekaran is a 68-year-old teacher and local historian living in Watagoda. From his classroom one can hear the whistles of the train engines making their daily trips back and forth from Colombo to Badulla. That battle has been eclipsed by the urgent issues of the day, he said. The line homes where many people live do not have adequate plumbing or sewage, people don’t feel they are paid enough for the heavy labour they do in the fields every day, and the schools on the estates do not have the same resources as on other parts of the island. 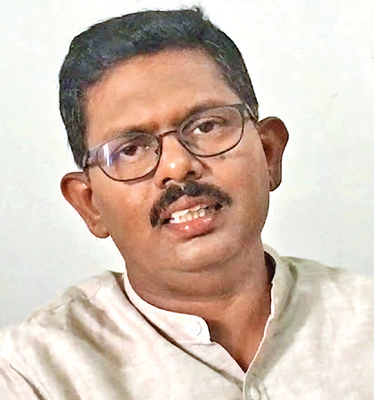 On top of that, Rajasekaran said, people are losing faith in the trade unions who have traditionally represented them in Colombo. With the local elections approaching, Rajasekaran said he is urging people in his community to vote independently. “I tell them: ‘Vote for a person who you think will do something good for you. We need someone to represent us,’” he said. At the Pedro Estate, Elizabeth Mary and her neighbours made their demands clear. They spoke of wages and sending their children to school so they might have a better life. But the question of citizenship appeared to be settled. 100% AGREE WITH THIS MP. 100% AGREE WITH THIS MP. NATIVE SRILANKAN TAMILS ARE ALSO RESPONSIBLE FOR THEIR STRUGGLE BY DISCRIMINATION.